Imagination Technologies today announced that it has extended its licensing agreement with Apple. The financial terms of the deal were not revealed, but Imagination confirmed the deal signed was a multi-year, multi-use agreement that provides Apple with access to the company's PowerVR graphics and video hardware. Imagination Technologies Group plc (LSE: IMG, "Imagination") announces that Apple has extended its multi-year, multi-use license agreement, which gives Apple access to Imagination's wide range of current and future PowerVR graphics and video IP cores. 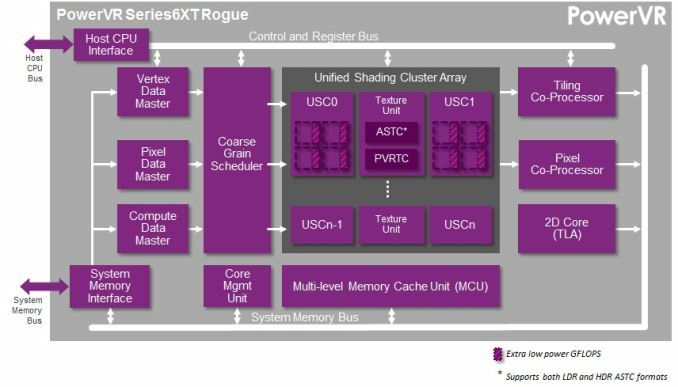 Imagination also recently announced its Series6XT PowerVR GPUs, which will replace the current Series6 graphics used in Apple's A7 chipset. In detail, the company claims that its newer GPU chips will deliver a 50% benchmark performance increase when compared to similar configurations of previous generation cores. The technology is expected to debut in devices sometime in 2015. Apple has used Imagination's PowerVR graphics architecture in all of its iPhone models to this point, and is a major investor in the company with a 10% ownership stake. For iPhone, I find the A7 to be way more than enough. Instead of boasting more power, it would be sweet if A8 was exactly as powerful, but double the battery(half the battery usage, not bigger battery). I thought Apple was going to design their own gpu moving forward (with all the gpu based hiring and all). Also, Apple owns like 10% or so of this company! wonder why they won't just buy them to keep off the competition. Lastly, I remember Imagination Technologies boasting 1tflop gpu with the series 6, what happened? A7 doesn't even come close and if true than A8 will only improve 50%? We were promised xbox 360/ps3 graphics long time ago from this company along with Qualcomm and nvidia but we are not even half way there yet! I agree with the focus on battery life instead of just performance. It'll be interesting to how the rumours of a bigger iPhone impact this though. If Apple does play the resolution/dpi race and move to 1920x1080, that will require a 2.9x more powerful GPU just to maintain the same performance/pixel of the 1136x640 iPhone 5S. That's why I'm generally supportive of the iPhone moving to a larger screen, but keeping the same 326 dpi so that you're not using GPU performance and power driving extra pixels that I don't think substantially improve display quality. Moving to a larger screen size and keeping 326 dpi means increasing the resolution which means a more powerful GPU is needed. As for battery life, the tech powering these devices is not the issue, its the battery technology we currently have. The tech field should put their cash into that research instead of better DPI displays or lower power CPU/GPU. I've known people who worked at IMG; apparently they wouldn't really be a great acquisition for Apple in terms of culture-fit and they reckon it'll be hard for them to keep their technology at the cutting edge as the competition heats up. They also compete in spaces that Apple has no interest in. For example, their line of dedicated ray tracing hardware has only professional applications at this point. They also just acquired MIPS, which is found in set top boxes and other closed box type hardware that Apple isn't in. ARM are investing heavily in their own GPU IP, and are apparently a much better long-term bet. The Mali design has appeared in a few Samsung and Chinese designs, but no consistent history of big design wins. Since using it, Samsung has also used ImgTec or just outright used a Qualcomm SoC (and their Adreno graphics) in some major territories like the US. Of course, the elephant in the room here is Nvidia. They recently announced that their desktop and mobile GPUs will share the same cores. That brings huge benefits to physics simulation and lighting, and means that they'll all support DirectX 11.1, OpenGL 4.4 and all the rest of it, so developers can port their games across extremely easily and make best use of the hardware they already know. Because of their massively-parallel architecture, GPUs scale pretty nicely - you can add or remove cores to tune the performance/power characteristics of the parts. Nvidia claims their K1 chip can trounce a PS3 or Xbox 360 while consuming only 5W of power (that's about the same kind of ballpark as the PowerVR chips Apple use, if not less). This chip can even out-perform an Intel Haswell (http://www.slashgear.com/nvidia-tegra-k1-out-performs-intel-haswell-in-early-benchmarks-13312939/)! The K1 is mainly aimed at tablets, but the fact that Nvidia are now sharing core designs between mobile and desktop parts is huge. The company's entire resources are now being spent optimising and improving that core. It would be nothing short of a miracle if IMG managed to stay competitive with that. Since Nvidia doesn't license their GPUs out (they do offer licenses, but have no design wins), they compete at the SoC level. As an overall SoC package, they have only a mixed history of success. They're particularly weak in their radio offerings, which is why Qualcomm gets so many wins. The actual GPU used in SoCs has pretty low visibility with most smartphone buyers because they simply don't care. The common denominator in graphics moves forward, their phone can play the latest game they want, and that's all most care about. Furthermore, K1 will show up the latter half of this year with a 32 bit ARMv7s design. By then, Samsung and Qualcomm have moved onto 64 bit. K1 won't be there until second half of this year if on schedule. Their overall SoC offerings still aren't that compelling when treated as a complete package.